Forget Christmas. Kwanzaa was the real deal in my house. My family may have celebrated the birthday of the Big Guy’s son, but my mum had once referred to it as “Kwanzaa Eve.” While other families were buying their turkey and stuffing weeks in advance, we were stocking up on corn and ginger. While other kids were singing Christmas carols, I was clapping in time to the traditional Kwanzaa songs I’d been practising for the past two weeks. My family didn’t play around when it came to Kwanzaa. Christmas was an afterthought. But growing up, I’d always wanted to be part of its magic. So every Christmas Eve night, I would leave a plate of cookies and a glass of milk out on the porch. And every Christmas morning, they’d be gone. I wasn’t naïve. I’d heard things on the playground. But I still hoped that maybe it wasn’t my parents taking pity on me. It was my little Christmas tradition. Six years ago, when I was eight, my family decided to increase my “Kwanzaabilities” (Kwanzaa responsibilities). That year, I would be taking part in the reciting of each day’s teachings. And I wasn’t just doing any old day – I was doing the seventh and last day, Imani. It was a lot of pressure to put on the shoulders of an eight-year-old. I was convinced that if I messed up, I’d ruin the whole Kwanzaa extravaganza. My family would throw fruit and barley at my head. On the day of Imani, just like every day in the past week, my parents and I opened our home to our relatives. They all flooded in at once, it seemed, bearing gifts of corn and grain, and all things organically African. One of them was my kooky granddad, who always and deliberately wore his hats at an angle, be it a bowler or a Christmas paper crown or his Kwanzaa kufi (trying saying that loads of times in a row). During the flurry of hugs and greetings, he pulled me aside. My grandfather’s glasses were lopsided, at an opposite angle to the lop-sidedness of his Kwanzaa kufi. He was kooky and interesting to look at, and the only the adult family member at whom I didn’t have to crane my neck to look in the eye when I was eight years old, since he was so short. But sometimes he said odd things that made you feel odd hearing them. “I’m ready,” I replied, even though I wasn’t. I nodded, leaning back so I wasn’t cross-eyed. My granddad had been saying weird stuff like this all week – auras, vibes, mojo. I was thinking of an excuse to back away when cries of horror sounded from the kitchen, where most of our guests had congregated. I saw it as a Kwanzaa miracle. I ditched my grandfather and went to see what all the fuss was about. On the kitchen table had been a fantastic display of fruit, vegetables and crops that my family had worked together to create on Kuumba, the day dedicated to creativity. Now, it looked like it had been trampled by a herd of wild goats. My mouth dropped open. The display had been perfectly fine an hour ago. What happened? And…was that jingle bells I heard? I looked around for the source of the noise and saw nothing. But there was no time to investigate. My family showed some good old Kwanzaa unity (Umoja), and together we cleaned up the kitchen. Once the ruined display was cleared, everyone began relocating to the living room. It was almost time. After my father lit the middle and the tallest candle, I would stand in front of my entire family and try not to ruin six days of successful Kwanzaa festivities. Suddenly I really needed to pee. Before I could even enter the living room, however, more cries of incredulity went up. This was quickly turning into a pattern. In the living room, my eyes bugged out of my head. The seven candles, sitting in candelabra on the mantelpiece, had been eaten. It looked like someone had actually taken a bite out of each of them. Uneven stumps of wax were all that were left: three red, three green, and a black one in the middle. I began to get angry. 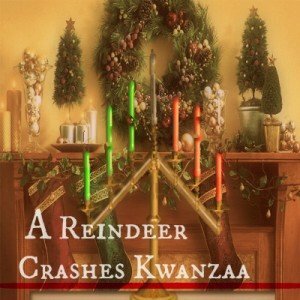 Someone was ruining Kwanzaa, on purpose. My kooky granddad pulled me out into the empty hallway. “What?” Had Granddad finally gone crazy? I hadn’t remembered to leave out the plate of cookies and the glass of milk on the porch last week on Christmas Eve. I’d been so worried about my speech, I’d forgotten about my tradition. But wait… a reindeer usually ate those milk and cookies? I was eight. I didn’t need any more convincing. Two minutes later I was tromping through the garden snow, scarf round my neck, wellies on my feet, Kwanzaa kufi on my head. I found the reindeer behind the garden shed. I stared. It looked exactly how it was meant to look – brown fur, majestic antlers, a bell dangling from a red ribbon around its neck. Slowly, I put the plate of cookies and glass of milk I’d brought with me on the ground in front of it. When it spoke, I leapt about five feet in the air. I opened my mouth to apologize, but he cut me off. My name is Monifa Anderson, I am a fifteen-year-old Londoner, and I enjoy combining fantasy, comedy and mystery when I write. Beautifully written, talented young girl, promising writer for the future.